Offered with a V6 or a V8 engine, the K900’s list of standard equipment will feature first-class accommodations and advanced technology. The range-topping V8 equipped with the VIP Package will add additional luxury amenities including reclining outboard rear seats. The K900 Premium V6 will launch at a later date with an available Luxury Package and Technology Package. The all-new K900 V8 Luxury and V8 VIP are expected to go on sale during the first quarter of 2014 with a V8 Luxury model starting at $59,5002 excluding $900 in destination charges. Pricing for the V6 model will be announced closer to launch. The K900 comes with a three-year, 37,500-mile complimentary scheduled maintenance program at participating Kia dealerships. Covering the first five service visits, the complimentary scheduled maintenance program is available to customers who either purchase or lease a new 2015 K900 and complete the maintenance work for their vehicle at participating Kia retailers. As an added benefit, K900 customers may enjoy the use of a Cadenza or K900 loan vehicle during their service visit3. The no-cost scheduled maintenance program, which excludes wear and tear items such as tires and brakes, complements Kia’s industry leading 10-year/100,000 mile new-car warranty and Roadside Assistance program4. The first glance of the K900 is designed to leave an indelible impression. The long 119.9-inch wheelbase and wide 63.8-inch front and 64.1-inch rear track of the V8 translate to considerable road presence. In profile, the swept rake of the greenhouse, subdued cut lines along the doors and high rear deck lid lend a muscular tension to the sheet metal. The K900 V8’s standard 19-inch multi-spoke chrome wheels are shod with 245/45R-19 tires up front and 275/40R-19 tires at the rear. Standard on the V8 are adaptive LED headlights. With 16 LED bulbs providing powerful, natural light for enhanced luminosity, the beams, which adjust to follow the bends in the road, shimmer beneath crystal clear lenses that pull back deeply into the front fenders. Soft-glow LEDs frame the multi-faceted headlights. Mounted low and at the far corners of the nose are sleek LED daytime running lamps and LED fog lights. Similar use of LED technology can be found at the rear of the K900. The trapezoid taillights offer defused LEDs for the brakes and bright LEDs for the turn signals. A tasteful chrome bezel cuts high across the K900’s standard powered rear deck lid, adding elegance and lending visual width. 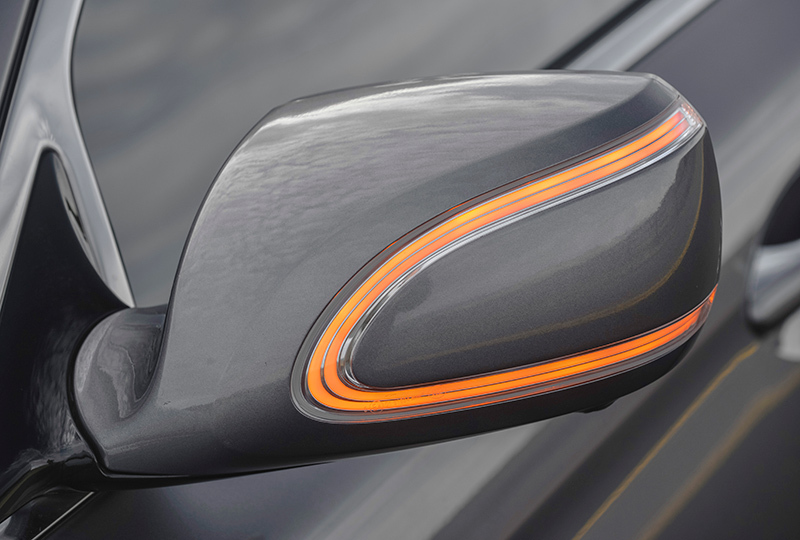 The standard power and heated rearview mirrors integrate auto dimming, LED turn signal indicators and Blind Spot Detection System (BSD)5 in a smooth, aerodynamic form that helps reduce wind noise. The rear bumper is accented with fully integrated dual chrome-tipped exhaust ports that mimic the shape of the taillights. Open the door to the all-new K900 and the same sense of elegant sophistication can be found within the luxuriously appointed cabin. The three-spoke leather-wrapped steering wheel is substantial and features controls for audio, cruise control, entertainment, and vehicle information. A heated wheel is available on the V6 and standard on the V8. Standard high-grade leather is found throughout the cabin on the V6, which can also be optioned with soft Nappa leather in black or white with contrasting piping. The V8 K900 arrives with standard Nappa leather. Soft-hue LED interior illumination is standard across the K900 line. Genuine walnut (with black Nappa leather) or poplar (with white Nappa leather) wood trim sweeps across the dash and door panels, beautifully complementing the richness of the interior and is available on the V6 and standard on the V8. A 12-way adjustable driver’s seat, including power lumbar support, is standard on both the V6 Premium and V8 Luxury models, and a 16-way power adjusted driver’s seat features power headrests and cushion extender for added thigh support as part of the V6 Technology Package and the V8 VIP Package. The front seats feature standard multi-stage heating and ventilation for individualized comfort in all climates. The K900’s executive-class accommodations continue at the rear of the cabin. Standard features include multi-stage heating for the outboard seats. Accessing a panel within the center armrest, rear-seat passengers also have the ability to control the vehicle’s ventilation system and may even fold the back cushion of the front passenger seat forward with the touch of a button. K900 passengers may also operate the standard power rear window sunshade, and retractable rear side window sunshades are standard across all models. A full-length panoramic roof with power retractable sunshade is standard on all V8 models. Opting for the V8 VIP Package takes rear seat comfort to another level. Both seats offer multi-stage heating and cooling, have the ability to independently recline and incorporate power lumbar support and lateral headrest adjustability. Well known for providing intuitively placed controls and easily accessible technology, Kia continues this tried-and-true practice in the 2015 K900. On the V8 VIP, front and center for the driver is the largest TFT instrument panel ever offered in a Kia vehicle. At 12.3 inches, the full-color LCD screen is at once easy to read and easily configurable, featuring different themes depending on the drive mode selected. Also included with the V6 Technology Package and V8 VIP package is Kia’s first Head-Up Display (HUD). The innovative full-color, height-adjustable display “floats” just over the leading edge of the windshield providing the driver important information such as vehicle speed, turn-by-turn navigation, and alerts including the Blind Spot Detection System (BSD)5 and Lane Departure Warning System (LDWS)5. First-class in-car entertainment comes standard in the form of a 900-watt Lexicon high-fidelity audio system, the most powerful and advanced system ever offered by Kia. An audiophile’s dream come true, the Lexicon system features a trunk-mounted 12-channel digital amplifier, 17 speakers, including a center channel and an inverted subwoofer located in the rear parcel shelf. The inverted design helps reduce encroachment into the trunk. The speaker arrangement is custom designed for the interior of the K900 to optimize sound quality for every seat in the house. Standard infotainment features include Bluetooth®6 hands free accessibility, HD RadioTM7, three-month complimentary SiriusXM satellite programming8 along with AUX and USB ports conveniently accessed through a soft-close genuine wood-covered panel in the center console. 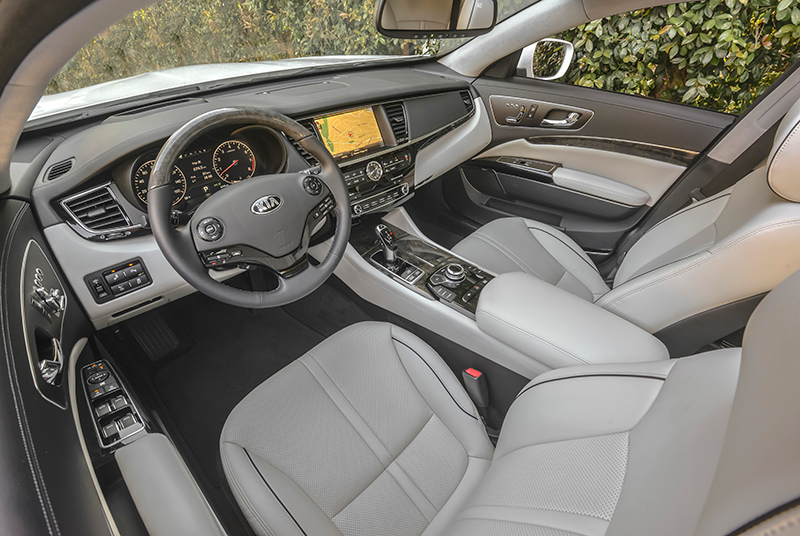 The audio system, along with standard navigation and Kia’s exclusive UVO eServices9 telematics software, are all viewed through a 9.2-inch full-color screen that is accessed through a new standard Driver Information System (DIS) found in the center console. Using a simple rotary knob surrounded by intuitively placed direct-access buttons, the DIS falls naturally to the driver’s right hand, allowing immediate access to the K900’s wide range of advanced systems, including entertainment and voice-command navigation functions. All K900s come standard with a power-operated trunk lid. A slim credit-card-style smart-key entry system that welcomes the vehicle owner by automatically extending the outside rearview mirrors and activating perimeter lighting is standard on all but the V6 Premium. Front and rear park-assist sensors and cameras are standard across the line for enhanced confidence and convenience5. Auditory cues notify the driver as the vehicle approaches an object with the tones emanating from the speaker located closest to the object. The parking display also indicates distance to the object via green, yellow and red lines, providing a visual aid to the driver. The V8 comes standard with Kia’s first Rear Cross Traffic Alert (RCTA) system5, which provides an audible warning to the driver if oncoming cross traffic is detected from the rear while the K900 is in Reverse. Working in conjunction with RCTA is Blind Spot Detection (BSD), which is standard on the V8 and available in the Technology Package on the V6. Opting for the VIP Package nets the new Surround View Monitor system5, which utilizes four discreetly placed wide-angle mini-cameras at the front and rear and within the outside rear view mirrors. The cameras provide a crystal-clear view of anything within several feet of the K900, providing potential safety benefits as well as easier maneuvering in tight spaces. A Lane Departure Warning System (LDWS) is standard on the V6 Technology Package and both V8 models. The camera-based LDWS monitors the K900’s position and provides an audible warning to the driver when the vehicle begins to drift too close to the lane markers. 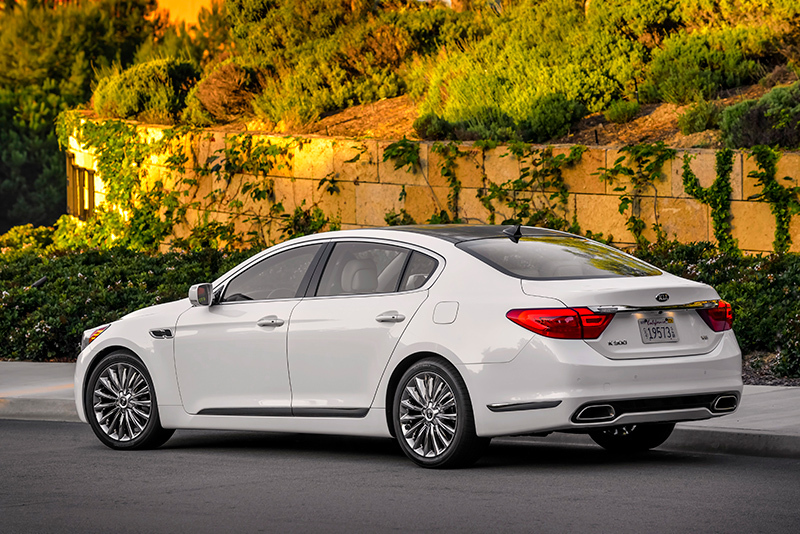 First introduced on the Cadenza, the K900 is available with radar-based Advanced Smart Cruise Control (ASCC)5. Included within the V6 Technology Package, and VIP Package on the V8, ASCC adjusts vehicle speed to help maintain a set distance to the vehicle in front and even has the ability to bring the K900 to a full stop. For added convenience, the system will also automatically accelerate the vehicle once traffic allows. 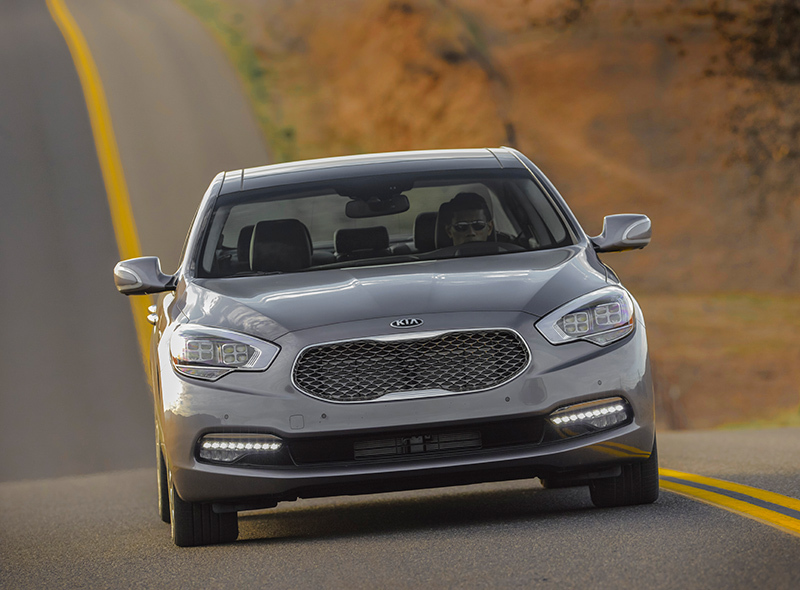 The K900 introduces Kia’s first use of Advanced Vehicle Safety Management (AVSM)10. Integrating the control of various vehicle monitoring systems, including the Electronic Stability Control (ESC), seatbelt mechanisms and multiple warning systems, the AVSM can alert the driver to danger, pre-pressurize the braking system and activate the Pre-Safe Belt (PSB) system11, depending on the anticipated level of a collision risk. If a potential collision is detected, AVSM warns the driver in three stages: an audible alarm, a visual warning on both the HUD and TFT LCD cluster and a cinching of the front seatbelts. A flagship should be equipped with the proper running gear, and the all-new 2015 K900 lacks for nothing. 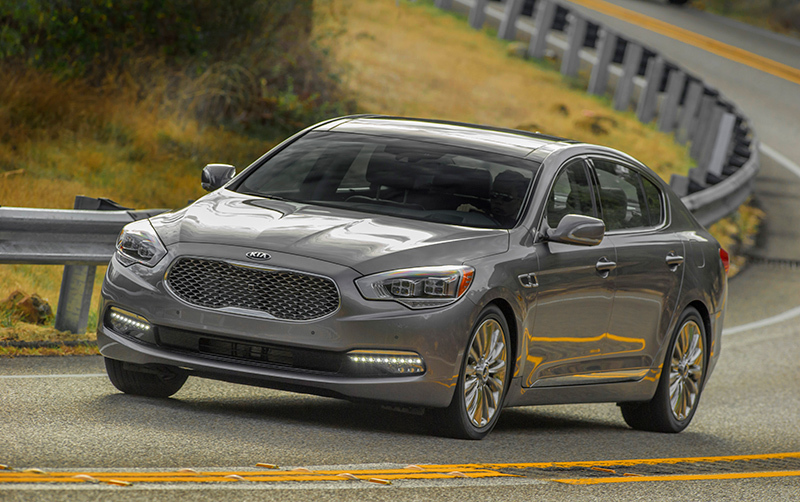 The K900 introduces the first V8 engine offered in a Kia sedan. The Tau DOHC all-aluminum 32-valve five-liter engine produces 420 horsepower. The engine is designed for efficiency with Gasoline Direct Injection (GDI) and dual CVVT variable valve timing on both the intake and exhaust. A special tuned air intake improves airflow while a roller-type timing chain and Teflon® coated crank oil seal reduce frictional losses. The fast-heating catalytic converter helps reduce emissions and is of a lightweight design. The V8 is mated to a new smooth-shifting eight-speed automatic transmission. Shift mapping is variable depending on the driver-selectable settings of Eco, Normal and Sport, and each mode also adjusts the electric steering’s sensitivity. The 3.8-liter Lamba V6 produces 311 horsepower, making it the most powerful V6 in the Kia lineup. A three-step Variable Intake System (VIS) is designed to provide optimum low- and mid-range torque. Similar to the V8, the Lamba V6 features GDI and CVVT technology to help improve efficiency. A variable-load oil pump maintains optimum pressure at both low and high speeds. Like its more powerful sibling, the V6 also is mated to the same eight-speed transmission with gear ratios tailored to best match the engine application. An advanced five-link fully independent front and rear suspension soaks up road imperfections while also managing to communicate what’s happening at each corner. Mounted on a sub-frame to isolate road shocks, the front suspension has coaxial coil-spring shock absorbers and a new friction bearing in the steering column to enhance straight-line stability and steering precision. At the rear, the suspension sub-frame also houses the differential, and the coil springs and shock absorbers are separate units, allowing for negative camber for improved cornering ability. The rear-drive layout of the K900 encourages spirited driving, and the solid chassis, consisting of 75 percent high and ultra-high tensile strength steel, utilizes advanced manufacturing methods that result in a body shell with exceptional strength and torsional rigidity. The K900 V8 includes as standard equipment staggered P245/45P-19 front and P275/40R-19 rear tires on 19-inch chrome alloy wheels while the V6 rides on 18-inch alloy wheels shod with P245/50R-18 tires. NVH is kept to a minimum with standard laminated front and side window glass and generous use of sound reducing materials.